In Seattle, many people are hyper-aware that not everyone celebrates Christmas, at least not in the traditional or spiritual way. There are many faiths and other holidays occurring at the same time, including Winter Solstice, Hanukkah and Kwanzaa. Wanting to give people an option (or an escape, as it turned out), I decided to lead a hike on Xmas Day. I chose Cougar Mountain, since it is a King County Park and does not have a parking pass required (no need to stress about buying something) and has fairly mellow trails that allow for a good hike, interesting features like waterfalls and big ferns, without a whole lot of elevation gain. We started out hiking up to Wilderness Peak, which does not have a view and barely seems like a peak, though I showed my group the summit register and penned our entry: "Merry Whatever, from the Seattle Mountaineers". Our second summit, Longview Peak, was savored quickly, as there was a storm coming in from the south and we were getting battered with wind. 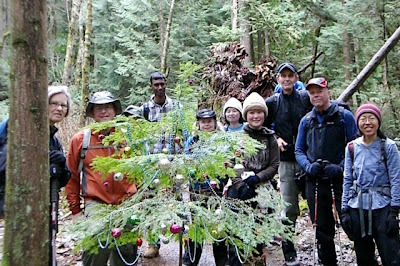 Descending from the peak, we came across a "Holiday Tree", decorated with ornaments and Mardi Gras bead necklaces, celebrating all the festivals plus the beauty of the natural world. Thanks everyone for a great day of hiking and Merry Whatever to All!